Consumer Reports may not like the iPhone 4 much, but it loves loves loves the MacBook Air. Tuesday the magazine and web site published its new computer ratings, and wouldn’t you know it? Apple’s new tiny laptops lead the laptop pack and earn CR’s “Recommended” designation. With a score of 67, the 11-inch MacBook Air ( ) received a 67 rating (out of 100), putting it in the Very Good range and making it hit the top of the list (which, honestly, was only two laptops long) of 11-inch laptops. CR rated it “very good” in its Ergonomics and Display categories, “fair” in Versatility and Speakers, and “good” in Performance. 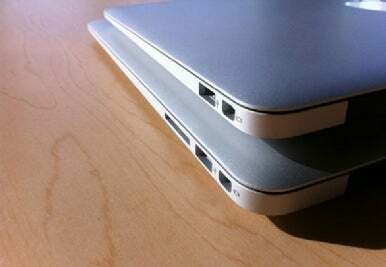 The 13-inch MacBook Air ( ) received a 78 rating (out of 100), and placed first in a much larger list of 13-inch laptops. The 13-inch Air scored “very good” in Performance, Ergonomics, and Display, “good” in Speakers, and “fair” in Versatility. Two 13-inch MacBook Pro models placed third and fourth in the category, with scores of 73 and 72, and the latter 2.4GHz model also received a “recommended” check mark. The 2.53GHz Core i5 15-inch MacBook Pro tops Consumer Reports’ 15- to 16-inch model chart as well, and the 17-inch MacBook Pro tops the 17- to 18-inch list. The only dark news for Apple? No Mac laptop appears anywhere on CR’s 14-inch model chart. But that’s probably just because Apple fails to make a laptop that size. For a whole lot more about the MacBook Air, visit our MacBook Air page or read our full review of the new MacBook Air models.